If you're planning on spending the weekend or a short holiday in Lyon, the city offers lots of opportunities to get out and about and discover things with tiny tots! With its highly varied cultural offer, appropriately designed facilities, workshops, tours aimed at children and numerous green open spaces, Lyon is a city well worth discovering with your family! Discover Lyon's heritage as a family! Lyon's heritage is very wide-ranging and easily accessible to families. 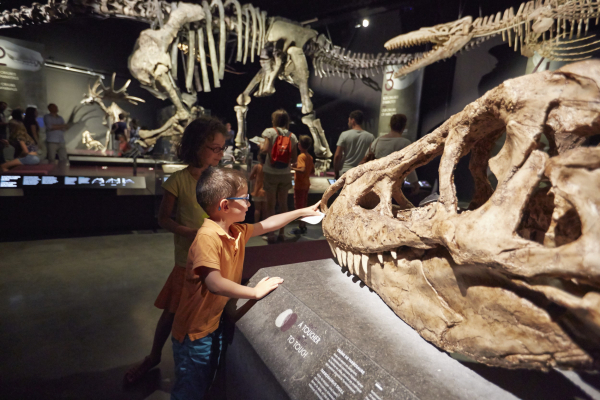 Among the essential things to do with little ones in Lyon, there's the Musée des Confluences, as much for its remarkable architecture as its permanent and temporary collections. For budding movie fans, we recommend the Musée Lumière, which explains the invention of the cinematographe in a fun way. The Puppetry Museum (Musée des Arts de la Marionnette) devoted to puppets has a beautiful collection, and is therefore perfect for family outings. In the same building, you can find out all about the city's heritage at the Lyon History Museum (Musée d'Histoire de Lyon). And when visiting Vieux-Lyon (don't miss the opportunity to explore the traboules with your little ones, for the delight of young and old alike), don't forget to take your children to the little Guignol Museum (Le Petit Musée de Guignol), our local puppet hero! The Lugdunum museum on Fourvière hill, devoted to Lyon's ancient history has a play area for little children and often organises free workshops for them. What's more, all the main cultural events in Lyon are designed with families in mind: the biennial dance parade and the festival of lights are ideal for all ages, and the biennial contemporary art event also does tours for little one. Lyon has absolutely everything you need! We also organise guided tours of Lyon aimed at families, and if you enjoy the idea of going for a stroll on your own, audioguided tours (in English, Italian, Spanish and German) are also a good idea. And why not tour the city on board the Lyon City Bus or the Lyon City Tram! You couldn't be bored if you wanted to! The Lyon Auditorium also hosts some very interesting concerts for children, and there are also festivals, such as Woodstower and Les Invites de Villeurbanne, and even the "mini sonores" within the scope of the Nuits Sonores festival, for all would-be clubbers! In summer, the lovely Tête d'Or park has unusual activities for little ones, such as a peep behind the scenes of the zoo, the botanical garden, the puppet session at the Théâtre la Maison de Guignol on Wednesdays, or the chance to cross the lake on a pedal boat. And if you fancy getting out of Lyon, the Lac des Sapins, or an outing in the Beaujolais area or to the Bird Park can be quite magical! And finally, the banks of the Rhône are ideal for a panoramic view of the city, and also have many games for children. And if you pass through the Fourvière area after admiring Lyon, you can try out the treetop adventure park with your children, down by the basilica. And if it's lunchtime and you're feeling peckish, we have drawn up a list of addresses in Lyon where your children will always be welcomed with a smile!